Windows XP users have not really seen a lot of love theme-wise from Microsoft since the release of the operating system. A measly handful of official themes have been released by Microsoft and the trend seems to continue for Windows Vista users. There is not really a reason to not to supply customers with fresh themes for their operating systems. If you look on the Internet you find many resources that cater to the needs of users who want to change the default themes. Official themes on the other hand have the advantage of being signed meaning that there is no need to tamper with the uxtheme.dll file that protects the operating system from unofficial themes. Vishal over at Ask VG discovered a new signed Windows XP theme that is also compatible with Windows Server 2003 that can be installed without changing system files. He discovered the theme in the Windows Embedded Standard CTP Refresh distribution and provided download links to it. 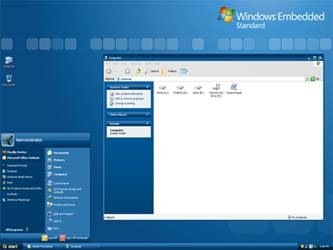 The theme is supplied as a self extracting executable that installs the theme in the right location in Windows. The theme can then be selected from the Themes tab in the Display Properties.